So…Clan Games.Lots of fun getting free, in-game items and resources for doing things you would otherwise normally do while playing! 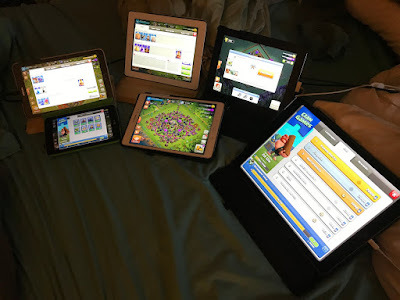 The thing about Clan Games, though, is that sometimes it takes a while to get through the challenges and it seems like a lot of times, the challenges you WANT are not the ones that are available.It never fails - when I want to go out raiding for Gold, there are no tasks for gathering up X amount of Gold, or if I’m running my daily attacks on the Builder Base there’s just Home Village tasks. Quite likely THE single, biggest complaint about the CoC Builder Base is the matchmaker. On the Builder Base, all matches beyond 1500 trophies are strictly based upon your trophies. The matchmaker takes the pool of everyone within a certain range of your trophy ranking (thought to be as many as 100 trophies, but never actually confirmed) and chooses you an opponent. Your Builder Hall level, defensive upgrades, troop upgrades…none of that is factored into the equation. It is strictly the number of trophies. SuperCell has told us they have some other magic in there to protect players below 1500 trophies and - ideally - match them to others at the same BH level, which makes sense since players that low are usually fairly new to the game. Everyone else, though - trophies are it. In the early days of the Builder Base, our common goal as players was to get through our loot-winning attacks as quickly as possible and move on.We had the Clock Tower (both pre and post nerf) that gave us several minutes of quick-time - a period during which our troops cooked and the Battle Machine regenerated in just a couple minutes top, which meant we could finish one attack and be ready to go for the next pretty much right away. Along came the “Trickler”.Tricklers would use up the entire time on the clock - 3 minutes plus preview time - as they trickled just a few Sneaky Archers into the base at a time.This ate up our precious boost time until the Clock Tower ran out and we were back to waiting 6-10 minutes between attacks. Custom Army Compositions - Taking it to the next level…. Each attack strategy has its strengths and weaknesses.As players mature their offense, they often choose just 2 or maybe 3 to focus on, providing enough strategies to get you ahead in trophy rankings so you can pull in more loot to upgrade your game.The key to being successful is both having multiple strategies at your disposal and - perhaps more importantly - knowing when to use each to the greatest effect.